For sale: printers, servers, computers, stew pots, elliptical machines and one Kittinger partner’s desk listed at $10,000 that was discovered in the basement of M&T Center. 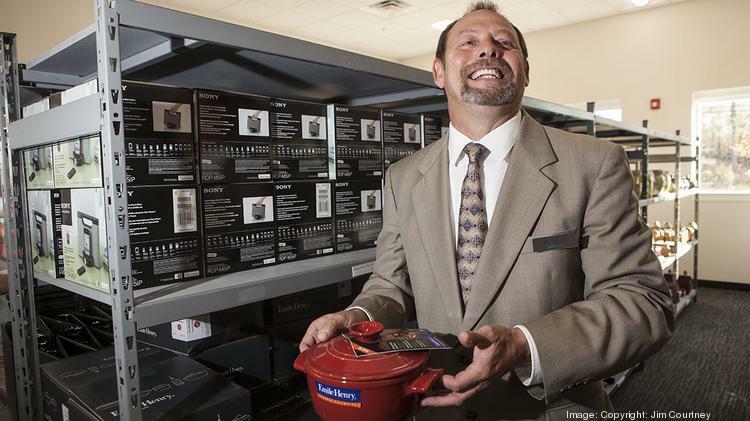 Those are some of the highlights of the inventory available at M&T Corporate ReUse, a department within M&T Bank’s corporate services division that sells pre-owned office assets to the general public. M&T Corporate ReUse was born in 2004 and is managed by Donald Blady Jr.
Now those assets have a new place to call home, at least until they get sold. On Monday, M&T Corporate ReUse opened a new facility in Cheektowaga that nearly doubles the space it previously occupied just down the road at 157 Sonwil Drive. The 40,000-square-foot building at 80 Sonwil Drive offers storage and warehousing space along with a showroom of goods that’s accessible to the public. Potential buyers will find a collection of desks, workstations, chairs and couches, artwork, computer equipment and an assortment of odds and ends such as briefcases, mouse pads and an antique safe for storing valuables. With the exception of some rare finds – including the Kittinger desk – most items are modestly priced. All computer equipment has been scrubbed of bank data and reinstalled with clean operating systems. It's fairly rare for a banking company to operate an in-house resale division. But Buffalo-based M&T (NYSE: MTB) – which turned 160 this summer – has acquired a lot of items over the years. Turns out, there was, and M&T Corporate ReUse was born in 2004. Donald Blady Jr., who joined M&T in 1981, manages the operation, which employs nine people full-time and a college intern from SUNY Buffalo State. According to Blady, about half of the products come from bank acquisitions, including the November 2015 purchase of Hudson City Bancorp Inc. in New Jersey, from which Blady and his team expect to receive seven tractor-trailers worth of goods in the next several weeks. The other half come from M&T itself, from computer upgrades for employees or building renovations throughout the eight-state footprint, Blady said. Proceeds from the sale of the products go back to the departments in which the products came from. The bank has also donated certain items to local nonprofits including Buffalo City Mission. M&T is leasing the space from Sonwil Distribution Center Inc. The deal was brokered by Patricia Collins of Tudor Collins Commercial Real Estate in Buffalo. Store hours are 7:30 am to 4 p.m. Monday through Friday. M&T also sells the items online at www.mtreuse.com and on eBay, but those sites aren’t fully updated with the available products. Including the new facility on Sonwil Drive, M&T now occupies approximately 1.7 million square feet of administrative and back-office space in Erie County. That includes commercial real estate that is bank-owned and leased.